They said it wouldn’t last but this long standing tradition continues to it’s second year. Dozens of prizes to be had in this spectacular Christmas raffle. Will the festive fairies have something in their stockings for you this year? Half Music / Half Torture. The lovely Katie Wickham will delight us with her acoustic charm and seasonal tunes. This will be followed by Kristmas Karaoke. The Lion’s clientele will attempt some festive favourites. The music starts at 3pm, those with delicate ears might want to depart before 4.30pm. There’s extra cash to be won in the final games of the year. Places are very limited so please ask at the bar for full details. Game 1 8.15pm. Game 2 10pm. Sorry, there’s no party to be found here. Mulled wine, log fires and Christmas Carols set the tone. Fine ale and good cheer to be had aplenty; last orders are strictly 10.30pm, so we can all be in bed when Father Christmas comes. The place to come for pre-dinner drinks. CAMRA’s pub of the year invites you for a glass of Christmas cheer – what better place to show off that that new jumper and entice others with the smellies that Granny bought? A tradition now – it’s horse racing all the way. Enjoy the delights of Kempton Park on the large HD TV. The big race is the King George VI at 3.10pm. Can Silviniaco Conti do it again or will his (Cue) Card be marked. Always a top day in The Red Lion – don’t miss it! Trying something different this year. Board games will be available (or bring your own) and join in to find out who’s the top Monopoly trader. I’ll be the Car! All Dominoes players are invited to play. Pairs will be made in a random draw. It’s £2 to enter with the prize money going to the finalists. Always very popular with the league players – there’s a maximum of 32 places, so please book early. Starting the year with a Sunday Session – although strictly speaking, it’s a Friday! It has become a tradition over the years, with the pub still set up in party mode anything can happen. Some years it’s a chill-out hangover cure and some years it starts off chill-out and ends up a full on rave behind closed doors! Which one this year? With the landlord now (just) in his fifties, the wise money is on the former. It is quite literally the Quiz of the Year. Test your knowledge on the events of the past twelve months. The quiz will start at 8pm but please arrive a lot earlier to guarantee a seat. 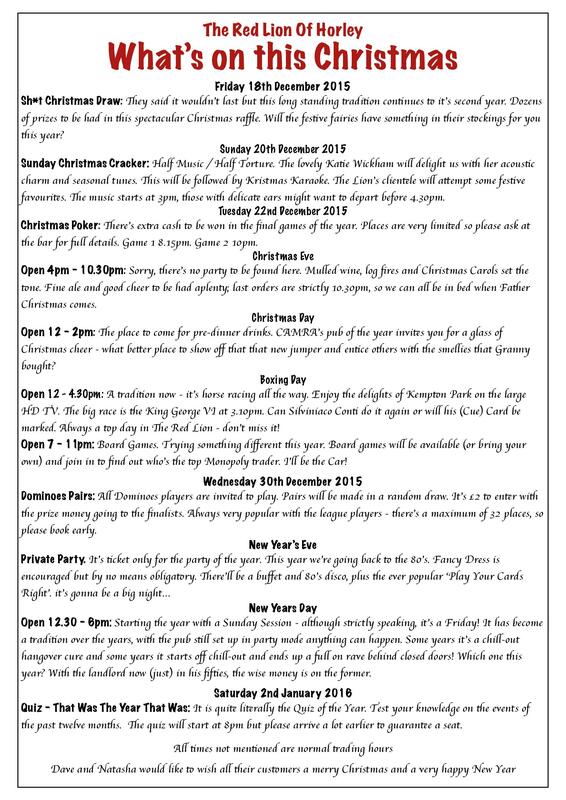 This entry was posted in Activities and tagged Christmas, New Year, The Red Lion Pub on December 15, 2015 by thehorleyviews.